Vouvray, probably the most well known wine in Loire Valley, is made from Chenin Blanc grapes, and is something of a chameleon; it can be dry, somewhat sweet, or really sweet. (Read more about Chenin Blanc). But Vouvray is always soft and drinkable and rarely bone dry. 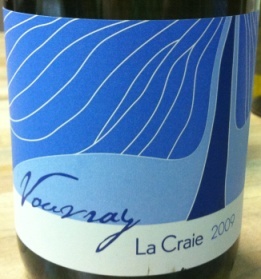 Full-bodied and elegant, La Craie Vouvray explodes with fragrant fruit: peaches and apricots drizzled with honey, earthy chamomile. It has a burst of sweetness on the tongue but finishes dry and luscious. The best of both worlds. Quite perfect for the palate that needs a ‘lil sugar to enjoy wine. Occasion: Tasted at a wine bar in Tampa, Florida. Availability: High end wine shops. Food pairing: Blue cheeses, grilled duck breast with apricot sauce, foie gras.